If you’ve come to this page, it’s likely that you have gaps in your smile that you simply wish weren’t there. Whether your teeth are missing because of decay or injury, they pose a serious risk to your dental health in addition to your smile’s appearance. You may have already noticed that the remaining teeth are drifting into the open space or that your jawbone and gums are starting to recede and change shape. Fortunately, we can help. Whether you are missing a single tooth or all of them, we guarantee that we have a treatment that can help you eat, speak, and smile with confidence again. Dental implants are the most comprehensive tooth replacement solution available today. A small titanium post is placed directly into the jawbone to support replacement teeth, and this not only gives your new smile unrivaled stability, but it also keeps your jaw full and healthy. Compared to any other treatment, dental implants are the most secure, long lasting, and natural-looking. Plus, unlike many other local practices, we can handle the entire procedure from start to finish, meaning you can rebuild your smile while always working with the doctor you trust. If you have a single missing tooth or even a few in a row, a dental bridge is one of the quickest and most effective ways to replace them. 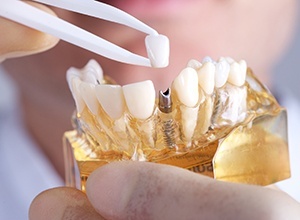 Your doctor will place dental crowns on the teeth surrounding the gap in your smile, and these will be used to support prosthetic teeth that literally “bridge” the space between them. They can improve the appearance of your smile, help you avoid jaw alignment issues, and you can even get them in as little as two visits. 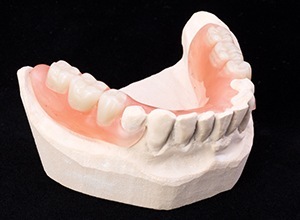 Full dentures are one way we can help you replace an entire arch of missing teeth. They consist of prosthetic teeth attached to a gum-colored base, and they sit directly on the gums using natural suction or denture adhesive. 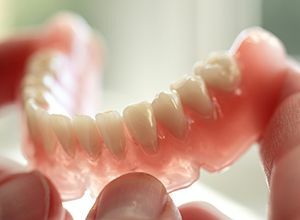 Thanks to the latest advancements in dental prosthetics, full dentures are now smaller, sleeker, and more comfortable than ever. Our team will work with you while they are being made to ensure you get the look and fit that works best for you. 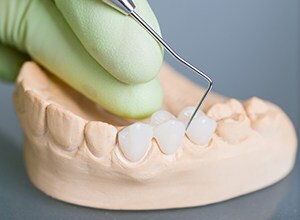 If you have multiple teeth missing throughout your mouth that aren’t right next to one another, a partial denture could be exactly what you need. Like full dentures, they are also made of prosthetic teeth attached to a gum-colored base, and they’re designed to fit among your natural teeth like the missing piece of a puzzle. They are held in place with small metal clasps, and they can be easily removed for cleaning and sleeping. If you’re walking around with an incomplete smile, you no longer have to. One of these treatments is perfect for you, and to figure out which one, please contact our office today for a FREE consultation.